China entered the New Year holidays as of February 18, with a firm trend dominating the country’s polymer markets. 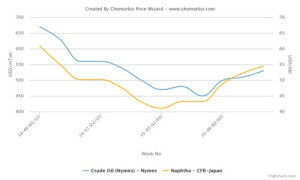 According to ChemOrbis,in line with the recent upturn in crude oil and naphtha costs, stronger feedstocks have shifted the direction of the price trend upward for most polymers after an extended period of decreasing prices. Plus, demand showed some recovery as higher costs persuaded buyers to return to the market to replenish some stocks before the holidays. 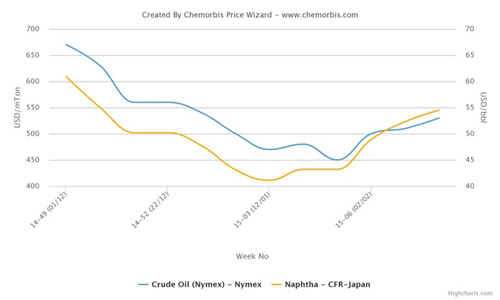 According to data from ChemOrbis Price Wizard, spot naphtha prices on a CFR Japan basis have rebounded by around $135/ton since mid January when they hit the bottom following a downturn that had been in place for almost six months. In response to firmer naphtha, monomer costs started to gain ground and pushed up polymer prices subsequently. On the Dalian Commodity Exchange, May PP and LLDPE futures posted week over week increases to close above the CNY8000/ton ($1114/ton without VAT) and the CNY9000/ton ($1253/ton without VAT) thresholds, respectively on February 17. Looking into China’s PVC markets, more Asian producers announced higher March prices ahead of the holidays following a Taiwanese major’s price hikes last week as per ChemOrbis. Players mostly concurred that strong demand in India may support PVC trends in other Asian markets, including China, after the holidays provided that upstream costs remain firm.